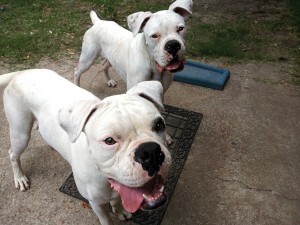 Two white boxers were recently abandoned after their family was evicted from a rent house in Clear Lake. Fortunately, a good neighbor and the landlord fed and watered the nine-month–old puppies until Second Chance Pets was able to acquire, vet and neuter them. 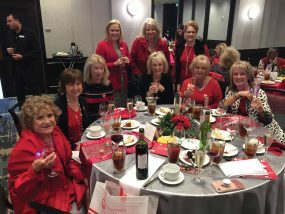 SCP volunteers have evaluated them and found them friendly and playful. Bruiser has a little black around one eye and Jack is the thinner dog. They had obviously been loved, but were certainly neglected medically. They are now with a foster and reportedly slept in her bed the first night. Currently they romp with three other boxers and get along well with them. They were perfect gentlemen at their first adoption day last week, allowing admirers to scratch and pet them, not barking once. SCP hopes to adopt the brothers out together since they have been confined in a backyard together since birth. These truly are lovers and would make wonderful family pets. SCP pets are shown on Saturdays from 11 a.m. to 4 p.m. at Petco at Bay Area Boulevard near Space Center. For more information email pets2adopt@yahoo.com or go to www.secondchancepets.org.